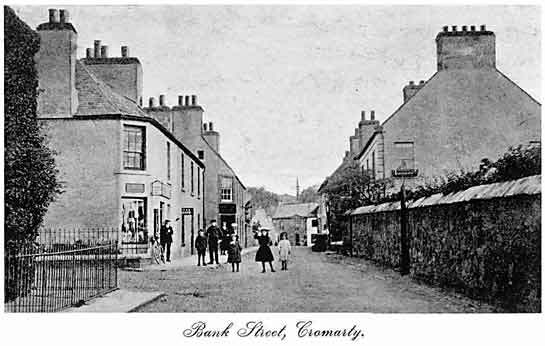 Bank Street, Cromarty showing the old tea shop on the left of the picture - 1920?? The railings at the left of the picture are no longer there, the pavement now being twice as wide as is shown here. Otherwise, apart from the shop signs, the view is not very different from the present day. The old tea shop is I believe number 30 Bank Street. This was run by my great aunt Miss Vera Rennie together with her sister Mrs Margaret A Piper. The family had numerous businesses in Cromarty, one of them was starting the first bus service to the Black Isles. Mrs Piper was the first female councillor on the Black Isles. They were the first shop to sell Sunday newspapers and ice cream on a Sunday, heaven forbid.